Here at Chamonix we have established a sterling reputation for ourselves with our clients for fine quality goods, prompt delivery, and up-to-date jewelry trends. 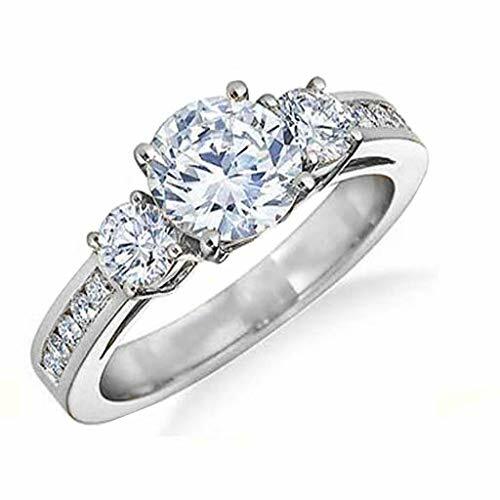 :Our jewelry Trends are Top Quality and Top trending products. What makes us Unique is the variety of products we can deliver to You! Never Get bored with the Same Product..
All Our Rings are bursting with Luster:Our Cubic Zirconia Captures the light like no other. GLAMOROUS- Our Tri-Stone Round Cut Expensive Looking, Dapper Engagement Ring is full of luster and can easily be used as a temporary Vaction Ring! Our Round Cut Center Stone Measures about 7.5MM while the encompassing smaller stones measure 4MM. We Guarantee Our Customers 100 Percent Satisfaction. This shiny Ring will put a smile on your face and your lovers as well. Share the Love! If you have any questions about this product by Chamonix Jewelry, contact us by completing and submitting the form below. If you are looking for a specif part number, please include it with your message.